Strengths: Slava Fetisov is one of the best defensemen to ever have played hockey. He had a unique on-the-ice presence, intimidating the opponent’s forwards. Fetisov was great at blocking shots, stealing pucks, playmaking, and creating some offense. Weaknesses: Towards the end of his NHL career, Fetisov’s offensive contributions steadily declined. Biography: There are many reasons why Slava Fetisov is a hero of our era. His life story doesn’t just make him one of the best hockey players ever, but a great person and leader too. In 1976, Slava was a sensation in his first season in the Soviet League with CSKA. He was eighteen years old, standing 6-foot-1 and weighing 220 pounds. A year later, he got a mysterious disease and was paralyzed waist down, losing 45 pounds in the process. The doctors said he would be lucky if he would ever walk again, but five months later, with pain, Fetisov took to the ice. At the World Junior Championship in 1978, Slava was named Best Defenseman, and his performance was good enough for him to be drafted by the NHL’s Montreal Canadiens, who later dropped Fetisov because of his unlikelihood of leaving the Soviet Union. 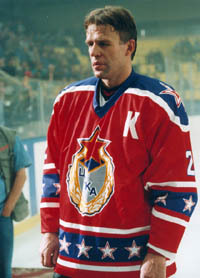 In early 1982, Fetisov was named the captain of both the Red Army team and the national squad. Fetisov felt enormous responsibility, especially in the aftermath of superstar Valeri Kharlamov’s death and the embarrassment at the 1980 Lake Placid Olympics. Being on a team that hadn’t lost for 39 straight games, and then losing one game, many players showed their discouragement, but not Fetisov. The Soviets’ 1984 Olympic win in Sarajevo was a highlight in Slava’s career. Then, tragedy hit again: Fetisov broke his leg, making him unavailable for the 1984 Canada Cup, and the next year Slava was in a car crash, leaving Slava’s brother, Anatoli, killed. Furthermore, Fetisov was a man who refused to sign up for the Communist Party, being one of the first to take such a stand. By 1989, Fetisov was tired of coach Viktor Tikhonov and wanted to defect, but his teammates would not play without him. Back in Moscow, Fetisov was under KGB surveillance, yet managed to get a ticket to America, being among the first Soviet citizens to receive a visa for open travel, opening the doors for everyone else to follow. This was definitely a personal victory for Fetisov. Being in New Jersey, Slava felt lost, unwelcome, exhausted and lonely. 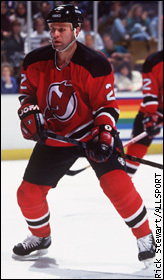 In his first two months with the Devils, Fetisov lost more than in his entire career with the Soviet national team. 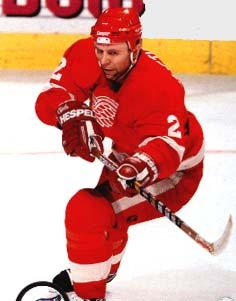 Fetisov found greater success after being traded to Detroit in 1995 to be part of the Red Wings’ ‘Russian Five’ – himself, Sergei Fedorov, Vyacheslav Kozlov, Vladimir Konstantinov and Igor Larionov. The unit was instrumental in Detroit’s Stanley Cup win in 1997. The celebration was cut short by another tragedy. Fetisov was in the limousine that crashed into a tree and left teammate Vladimir Konstantinov and Wings’ trainer Sergei Mnatsakanov with brain damage. 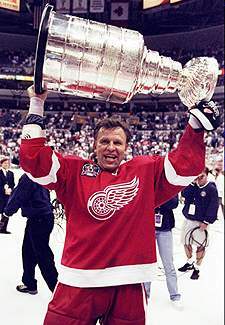 Fetisov lost feeling in his right leg, but recuperated to play one more season and win the Stanley Cup again. After retiring, Fetisov was an assistant coach for the Devils from 1998 to 2002. He was the head coach of Russia at the 2002 Olympics, leading the team to a bronze medal. After that, he returned to Russia to accept a post chairing the Federal Agency of Physical Culture and Sport (Rossport). Since 2008, Fetisov is a Senator in Russia’s Federation Council; he represents the far eastern region of Primorsky Krai. Fetisov also worked with the World Anti-Doping Agency and helped create the Kontinental Hockey League. In 2009, he became the President of the CSKA Moscow hockey club and even suited up to play in one game. Fetisov is truly a legend, a hero of humanity. A teammate died, his brother died, his every move was followed by the KGB, he fought for freedom, battled loneliness in a foreign land, two more friends were left paralyzed for life… but Fetisov countered that with two Olympic gold medals, two World Junior Championship wins, seven World Championship wins, nine Soviet all-star berths, nine USSR 1st team honors, thirteen Soviet League championships, three European Player of the Year awards, two Stanley Cups, and the respect of millions.